"An Exceptionally Authentic Account of the Path to Mastering Dating Skills "
I recommend this to men who want to 'pick up' a lot of women, as it gives great insights into the 'darker side' of those aspirations and where they can lead. It will push you to challenge your desires, and ask you what you really want to get out of the journey. There are a few auto-biographical and biographical style books that have come out. The most famous is "The Game" by Neil Strauss. Then there is a semi-autobiography from Mystery (Erik von Markovik) in "The Pick up Artist" which includes some scenes from Mystery's life in an excerpted fashion. The best to come out to date was Metawhore by Hypnotica (Eric von Sydow) describing his life and sexual and inner game exploration. Both of these are relatively authentic, but keep everything upbeat by missing out on some of the gory details and take narration liberties here and there to improve the storyline. 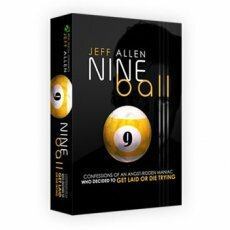 "Nine Ball" is similar to Metawhore in that it's an extremely authentic and direct account of the worst of Jeffy's path to learn to get better with women. It includes all the gory details. In one of his earlier seminars Jeffy delivered a lot of value to men who wanted to learn to get better with women by telling his darker side story of the low point his quest (that many considered a huge success) had led him to. This footage is included in the "Transformations" DVD from Real Social Dynamics. It was something that needed to be said out loud, because behind doors at the time, it was getting talked about. But the more senior dating coaches kept this rather negative view to themselves (note: To learn about other recounts of the dark side see Men who become obsessive about dating advice. Some of the lows Jeffy goes through are relatively self destructive, and when he gets to a point where he sees the hate that a lot of women he has met have towards him he hits an all time low. This is not unusual. It is a journey that has been repeated by many men, and for this reason the account can be invaluable reading to an open minded beginner - who wants to avoid the pitfalls of success. The book was pretty nostalgic if 'shuddering' for me personally, because Jeff highlights a lot of the techniques he used as he walks us through his early days of learning to meet, attract and pick up women. Why shuddering? A lot of the techniques that were used back in 2002 and 2003 where the largest part of Jeffy's narrative takes place have since been passed over. At the time these tools seemed all powerful, but dating science has moved on a lot since then. The point here is - it's great to see how it used to be, which is entertaining. However, don't expect to learn a lot that you will actually want to go out and apply from this book. Better. Take it as an example of a lot of paths that you can 'not walk down' thanks to someone having already done it for you - and explained where it leads. I'd recommend this particularly for guys who are starting to become successful with women. At this point it will offer some great food for thought at what you should be doing with your skills to actually gain 'satisfaction' from them. You may also just enjoy it for the entertaining look into the history of a well known pick up artist.